January 15, 2014 represented the 85th birthday of the martyred civil rights, social justice and peace activist, Dr. Martin Luther King, Jr. Each year a federally-recognized holiday is commemorated where office buildings, schools and mail delivery is shut down on the third Monday of January. MLK Day this year takes on an added significance in light of the renewed attacks on municipalities throughout the United States. Workers and students within public educational institutions are facing massive lay-offs and school closings, while local governmental employees are threatened with job elimination and the theft of pensions and healthcare programs. The city which has gained the most national and international attention in this regard is Detroit where the largest municipal bankruptcy in U.S. history was imposed on the majority African American population during the summer of 2013. Nonetheless, additional cities such as Stockton, San Bernardino and Vallejo, California; Jefferson County, Alabama; Providence Rhode Island, Harrisburg, Pennsylvania and others are either in bankruptcy or facing extreme austerity measures. These developments are not taking place by accident. The character of capitalist restructuring has cut wages and social spending for several decades. What is now taking place in the public sector has been enacted by private corporations in auto, steel as well as service sectors. Over the last period low-wage workers in the retail and fast food industries have struck back through mass demonstrations and one-day wildcat strikes. These actions have raised the political consciousness level and social militancy of the workers themselves and their supporters. In several cities and states across the U.S. there have been debates and legislative initiatives within governmental structures aimed at raising the minimum wage. Nonetheless, what underlies the growing impoverishment of the working class and nationally oppressed in the U.S. is the mad drive for profits on the part of the ruling class. After 1965 with the passage of the Voting Rights Act, the Civil Rights Movement began to focus more on the plight of African American workers and the persistent poverty in rural areas and the cities. In 1966 King joined the Chicago Freedom Movement, re-locating for several months in the city staying in a housing project where he saw directly the impact of racial discrimination in the northern region of the U.S.
During the Chicago campaign of 1966, when the mass movement took demonstrations into the white areas demanding open housing, King and his comrades were met with violence from racist mobs whose attitudes were no different than those in the South. During that summer the African American and Puerto Rican communities erupted in urban rebellion illustrating the degree of urgency related to the struggle to eliminate national oppression and economic exploitation. 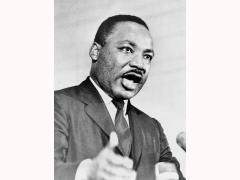 After eight months of organizing and struggle in Chicago, King did not achieve the aims that he set out to accomplish. The elimination of sub-standard housing, the creation of jobs and the liberation from national oppression can only be accomplished through the building of a decisively anti-capitalist mass movement. By early 1967, King had come to the realization that the Southern Christian Leadership Conference (SCLC), his organization, could no longer refrain from speaking clearly in opposition to the war in Vietnam and to link the carrying out of this intervention to the failure of the federal government to effectively implement programs to address structural unemployment, inadequate housing and institutional racism. Over one year prior to the SCLC coming out against the war, the Student Nonviolent Coordinating Committee (SNCC) had issued its militant statement against the occupation of Vietnam on January 4, 1966. The SNCC statement said “We believe the United States government has been deceptive in its claims of concern for the freedom of the Vietnamese people, just as the government has been deceptive in claiming concern for the freedom of colored people in other countries as the Dominican Republic, the Congo, South Africa, Rhodesia, and in the United States itself. “We, the Student Nonviolent Coordinating Committee, have been involved in the black people’s struggle for liberation and self-determination in this country for the past five years. Our work, particularly in the South, has taught us that the United States government has never guaranteed the freedom of oppressed citizens, and is not yet truly determined to end the rule of terror and oppression within its own borders,” the SNCC statement continued. King’s last campaign was in support of winning recognition for African American sanitation workers in Memphis. The workers had walked off the job on February 4, 1968 after two of their colleagues were killed in an industrial accident brought about directly due to racism. The strike galvanized the African American community and the national leadership of the American Federation of State, County and Municipal Employees (AFSCME). The workers were seeking recognition as an AFSCME union in a city where collective bargaining and strikes were outlawed for municipal employees. Nearly 46 years later in Detroit, workers within the majority African American city are under serious attack. Retirees are being threatened with the theft of their pensions. The intervention of the Moratorium NOW! Coalition and its allies have been instrumental in the overall political and ideological struggle to change the character of the debate and discussion related to the economic crises. When the agents of the bankers and corporations say that the unions, pensioners and corrupt politicians are responsible for the imposition of emergency management and bankruptcy, they have been answered with demands for the cancellation of the debt, the preservation of pensions and reparations for the rebuilding of the beleaguered city. Corporate media has echoed the position of the ruling class saying that there is no alternative to the dictatorship of Wall Street and the imposition of austerity. The Moratorium NOW! Coalition has responded saying that there is plenty money for the maintenance of city services, pensions and jobs if it were not for the illegitimate bank debt that is strangling Detroit along with other cities across the U.S. The crises of the cities in the U.S. is mirrored by the economic and social conditions in Southern Europe, Africa, the Middle East and other capitalist-dominated states and regions of the world. It will take a nationwide and indeed international movement of workers and the oppressed to overthrow the system of monopoly finance capital. King’s opposition to imperialist war is also essential in the overall struggle for emancipation. The Pentagon budget continues to drain those resources that are so vitally needed to rebuild the cities and re-employ the workers at decent wages and conditions of employment. If King were alive today he would be at the forefront of the current struggles against the destruction of the cities and the impoverishment of the workers and oppressed. He would be seeking to end the U.S.-NATO occupation of Afghanistan, the growing intervention by the Pentagon in Africa and the escalating drone attacks throughout Central Asia, the Middle East and the African continent. The way his legacy, and that of the Civil Rights Movement as a whole, can truly be honored is to continue and intensify the campaigns against poverty, national oppression and imperialist militarism. It is only through such efforts that humanity will be genuinely liberated and the attainment of peace and social justice can be realized for the majority of the people across the planet.